Selecting the right ceramic toilet basins for your bathroom is important, as this will define not only the look and feel of the bathroom, but also the ease by which the bathroom will be maintained. There are, however, a variety of options available when it comes to choosing ceramic toilet basins and toilet bowls and you should have a working knowledge of the options available before renovating or refurbishing your bathroom. 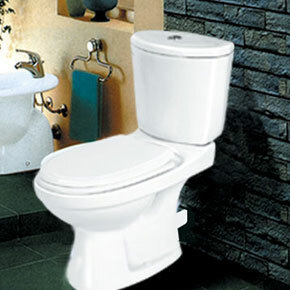 There are several reasons why ceramic sanitary ware is most popularly used in bathrooms. Over the years, and in most homes, it is common to find that ceramics allow for the greatest longevity of bathroom fixtures, including ceramic toilet basins and toilet bowls. What is important before making a decision is to consider firstly whether you would prefer the bathroom to have full ceramic fixtures or whether you are willing to consider a mixture of features, such as ceramic toilet basins on marble counter tops, the type of flooring that is used in the bathroom and other miscellaneous features. If you have opted for ceramic toilet basins and toilet bowls in your bathroom, you will have to be familiar with the best methods to maintain these. When using ceramics, particularly light colored pieces, you will find that there is a risk of staining, whether from rust or other causes. Such stains may be difficult to remove and regular toilet cleaners or powdered chlorine based cleaners may not be able to provide a solution in extreme situations. It is possible to use mechanical pads that are chemical free. It will require you to use elbow grease to get the stains off your ceramic toilet basins or toilet bowls, but can be used effectively for the more stubborn stains. The other alternative is to use pumice-scouring sticks, and these not only remove the stain but also aid in polishing the ceramic surface. There are other methods available and you will want to check whether these products have a chemical base, and if they do, how you should use them safely. Also remember that such products should not be used too frequently and should be safely stored away beyond the reach of children, as they usually contain poisons.